We meet on the edge of Saigon’s Japan town. L’Usine’s flagship concept-store and café, where we find Takaaki Uemura, is just across the street from one of the many entrances to District 1’s Japanese enclave. Takaaki knows the area well. 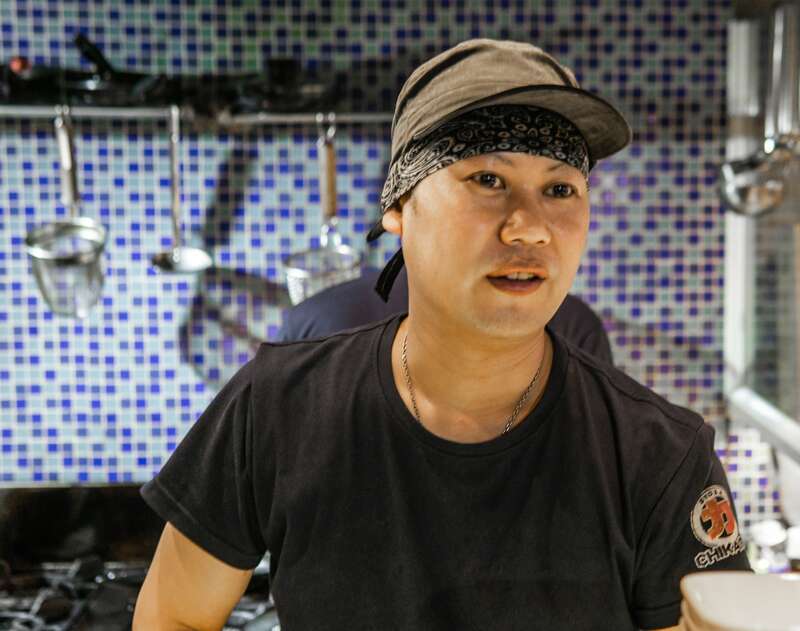 Seven years ago he opened his first restaurant, Robata Dining An, here on Le Thanh Ton. “Robata Dining An is an izakaya so it’s fun with lots of drinks, over 100 dishes, and smiling staff. But Sushi Rei is a little more serious,” he adds about his other more famous restaurant a few streets over in an alley off Nguyen Thi Minh Khai. Takaaki Uemura is from the southern Japanese prefectural capital city of Fukuoka, although he moved to Saigon from Los Angeles. “I was a typical salaryman,” he laughs about his two years in California. 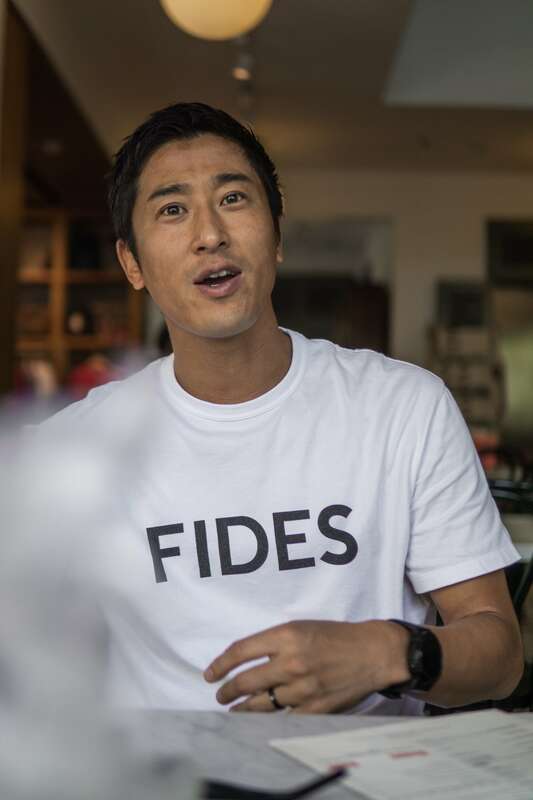 Then, after tripping around the region “from Thailand, to Cambodia, and the Philippines,” he connected with the entrepreneurial energy of Ho Chi Minh City. Robata Dining An and Sushi Rei are two of seven restaurant projects he’s been a part of here. Takaaki Uemura at L’Usine’s flagship on Dong Khoi. “Anyway, let’s go?” he asks as we set of into Saigon’s Japan town. “Anyway, let’s go?” he asks as we finish our americano coffees and set off into the 200,000 m2 area that is Saigon’s Japan town. It’s fitting that we begin our tour of Saigon’s Japan town at Robata Dining An, the restaurant that started everything for Takaaki Uemura. 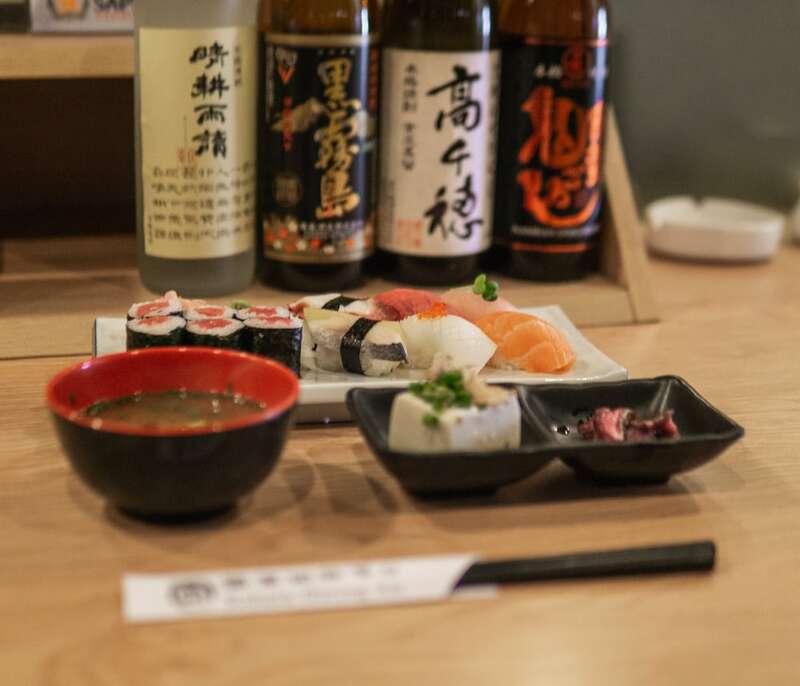 We take two seats at the long counter and order the sushi set—one of over 50 lunch options. 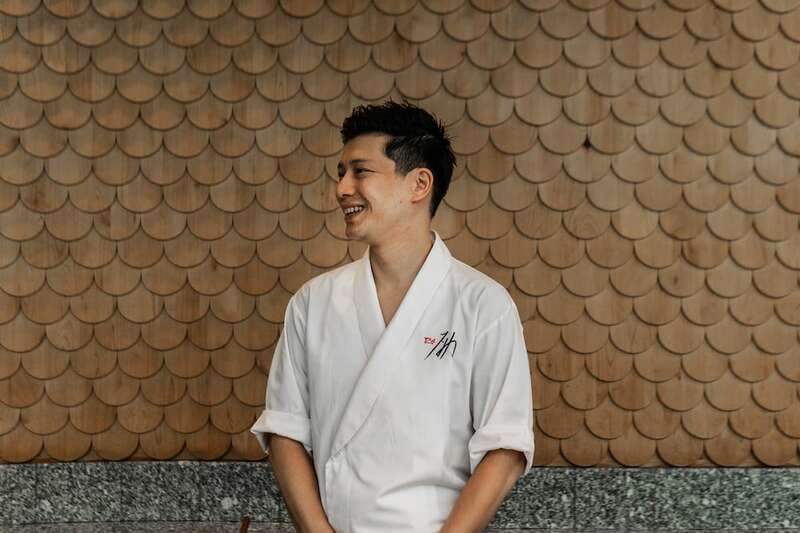 Takaaki Uemura inside his first restaurant in Saigon, Robata Dining An. Robata Dining An has an extensive lunch menu that includes their 12-piece sushi set. The sushi set arrives. There’s six pieces of tuna roll and six pieces of sushi: salmon, tuna, horse mackerel, octopus, golden herring, and squid. 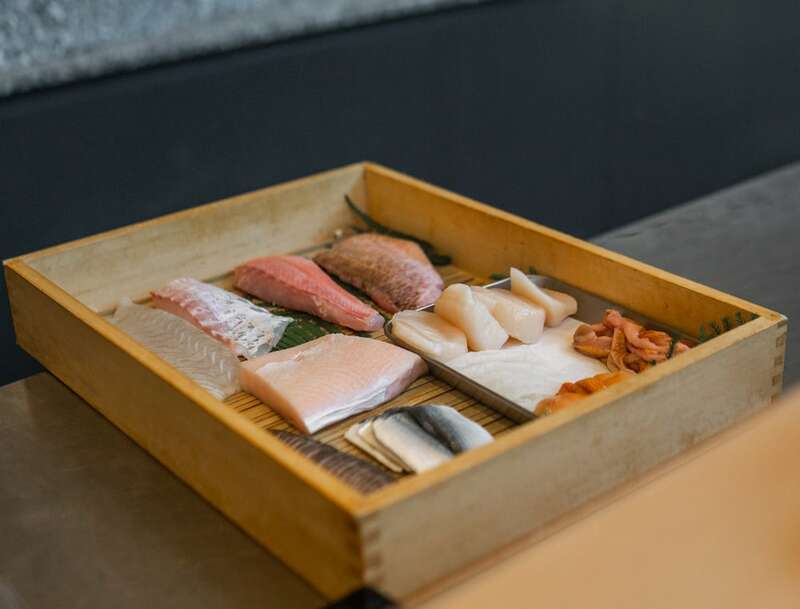 “Unlike at Sushi Rei, here we have a mix of local and Japanese fish,” Takaaki says. “This was one of the first restaurants in Saigon’s Japan town to serve ‘teishoku’—the classic Japanese set lunch,” Takaaki explains as we take a seat in Fujiro. 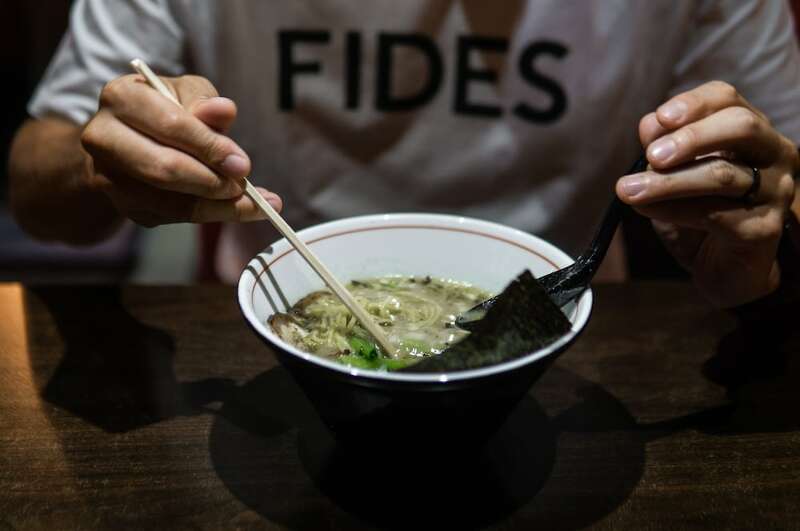 “It’s kind of a franchise taken from a successful chain in Tokyo.” The restaurant started in a basement a few doors down. They added this ground floor location, at 8A/9B1 Thai Van Lung, a few months ago. “This was one of the first restaurants in Saigon’s Japan town to serve ‘teishoku’—the classic Japanese set lunch,” Takaaki Uemura says as we sit down in one of Fujiro’s booths. In the window is Saigon’s Japan town’s best display of “shokuhin sampuru,” the incredibly authentic looking models of fake food. While burger chains deliver dishes that barely resemble the succulent patties topped with crisp iceberg lettuce shown in the pictures on their menu boards, our tonkatsu set looks just like the version on display outside—perfectly crisp breadcrumbs coating a succulent slab of pork. 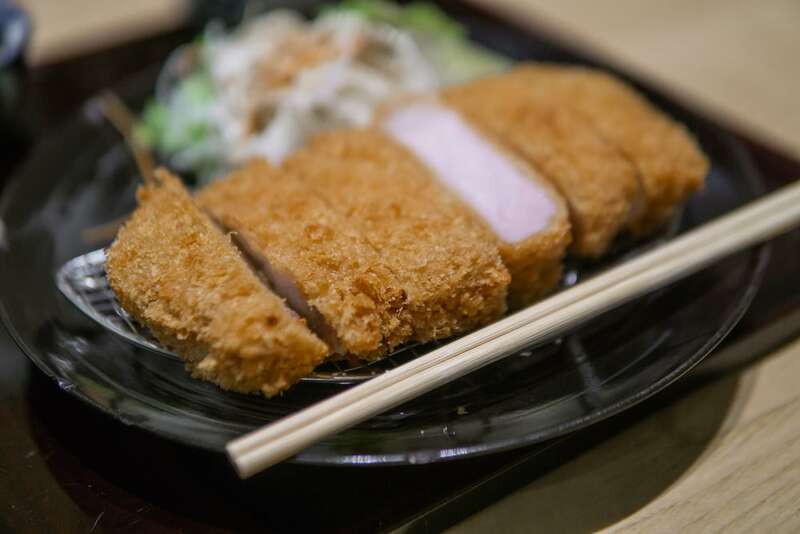 Fujiro’s famous 3cm-thick tonkatsu pork cutlet. Takaaki grinds some sesame seeds and adds the sweet soy-miso sauce to the dipping mixture. “Japan was cut off from the rest of the world for so long, we spent lots of time looking inwards refining things,” Takaaki smiles. 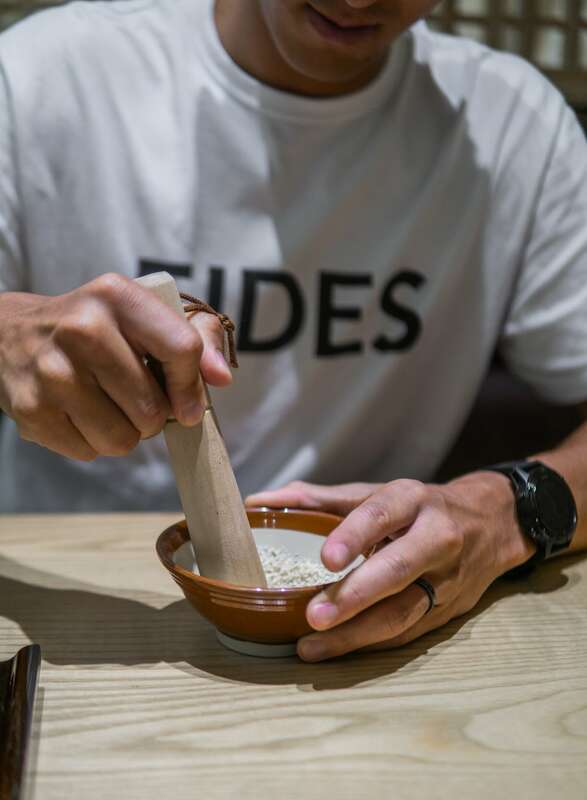 Takaaki grinding the sesame seeds that are the base of the dipping sauce served with the tonkatsu set. “Take these,” he says, holding up some chopsticks, “we had time to think, ‘how can we make these better and better. 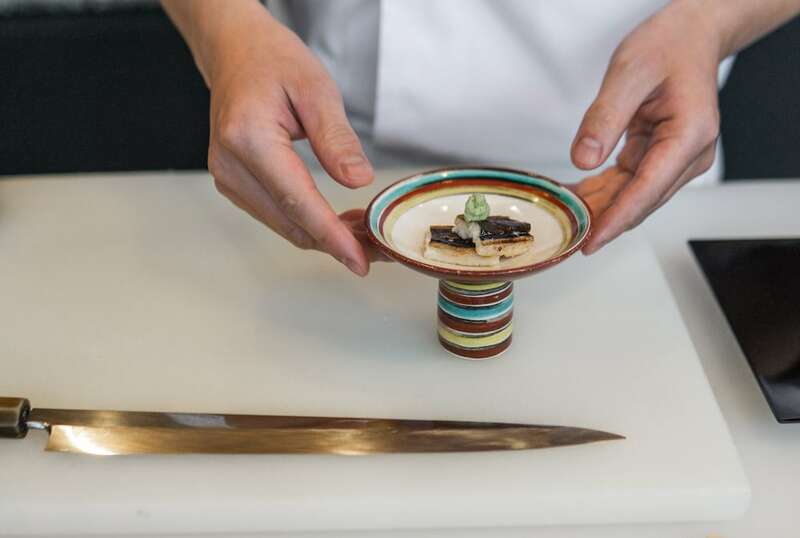 It’s the same with food, many Japanese will go to a restaurant that specializes in one dish because they know the owner will have spent time carefully refining it,” he continues. “Like this,” he says looking down at the Fujiro’s tonkatsu set. Everyone who knows this area has their favorite ramen shop. There’s Ramen Danbo—that has an outpost in District 2—and the chicken ramen shop, Mutahiro, with its rainbow signage. We opt for Ryu-Shin right by the Le Thanh Ton entrance to this part of Saigon’s Japan town. There are lots of ramen shops in Saigon’s Japan town. We go to Ryu-Shin next to the entrance on Le Thanh Ton. “Good ramen is all about the broth,” Takaaki says inside. Although Ryu-Shin is famous for its pork broth ramen, Takaaki orders a bowl of chicken paitan soup ramen. “It’s all about the broth,” he nods approvingly examining the creamy chicken bone soup. “Of course, boiling the bones takes time, and time means more expense for a restaurant,” he adds. “It’s all about the broth,” Takaaki nods approvingly examining the chicken bone soup. The menu even includes Chinese food, so we decide to test them out by ordering another “teishoku,” their mapo tofu set. Mapo tofu is often quite bland, but Ryu-Shin’s has the right aromatic Szechuan taste with its gently tongue-numbing peppercorns. We meet again at Sushi Rei around 5pm—shortly before it opens. Although it’s a few streets away from Saigon’s Japan town, Takaaki wants to show us his most famous restaurant. Two of Sushi Rei’s staff wait outside the restaurant at the end of the alley off Nguyen Thi Minh Khai that leads up to it. Even before the making of the documentary “Jiro Dreams of Sushi,” Jiro Ono, the chef at Tokyo’s Sukiyabashi Jiro, was a legend. Endless testimonials call the twenty-minute “omakase” dinner the best sushi experience in the world. “It’s not about how expensive this fish is,” Takaaki says about the ingredients Sushi Rei fly in from Tsukiji Market. Rei Matsuda worked under the famous chef in the nondescript restaurant in a Tokyo subway station for nine years. 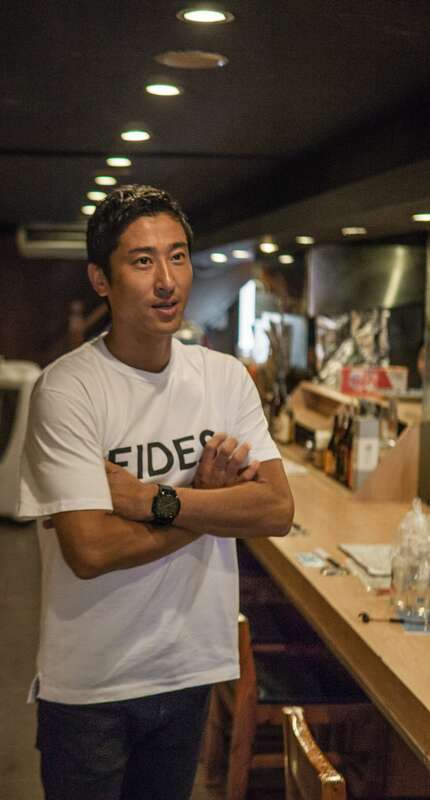 Then he opened his own six-seat restaurant, Sushi Masuda, in Omotesando. Around the same time, he also began consulting on this, Takaaki Uemura’s new project. We step inside the discreet entrance. Further down, there’s another separate door to their private dining room. Chef Tomo inside Sushi Rei’s main dining room, and in front of the 4,000 fishscale tiles made from hinoki wood, from Kyoto, designed by Japanese architect Joe Chikamori. The wall behind the chefs has 4,000 pieces of hinoki wood shaped to look like fish scales. The Japanese architect Joe Chikamori spent half a year designing Sushi Rei, which took another six months to build. 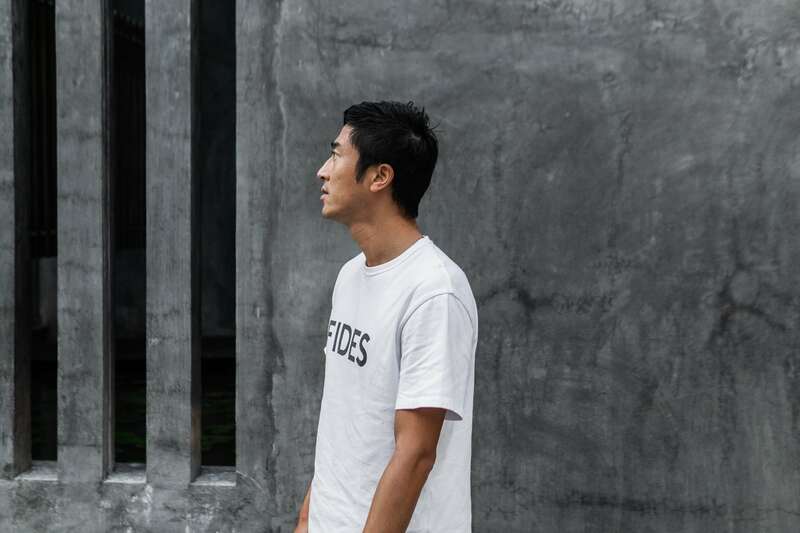 “Originally, the concept was something more traditional,” Takaaki explains, “but Joe was keen to do something more modern….and I think we found a nice balance,” he says happily. Sushi Rei’s head chef, Tomo, serving up some sushi including a piece of chūtoro, medium fatty tuna, alongside slices of house-made ginger. 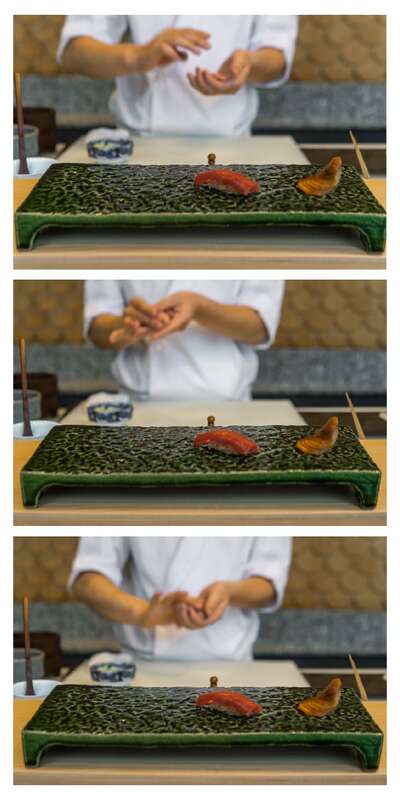 Tomo, Sushi Rei’s head chef, carefully puts two pieces of anago—conga eel—on an elaborate circular plate. Then he places a piece of abalone sushi onto the emerald-green serving stand. On top is a small circle of abalone liver paste that’s an even darker shade of green than the stand. Then he grinds fresh sea salt onto a slice of squid. And after that he serves us chūtoro, a piece of medium fatty tuna. Anago, or conger eel, served with wasabi. Chikara, with its strong branding and bistro-style chalkboard menu, represents the recent evolution of the bars and eateries in this part of town. 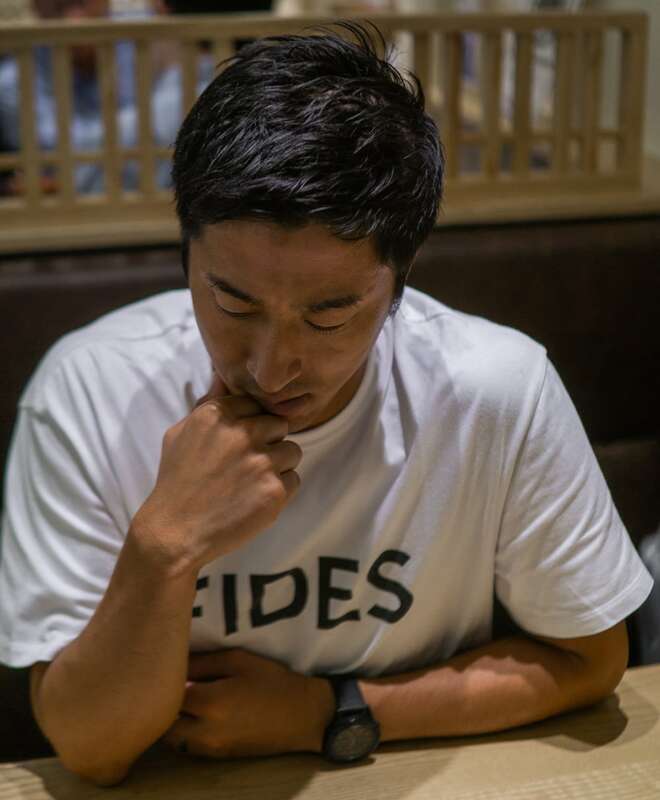 “The name ‘Chikara’ means ‘power,’” Kazuya Yokoyama, one of the restaurants two co-founders, says. 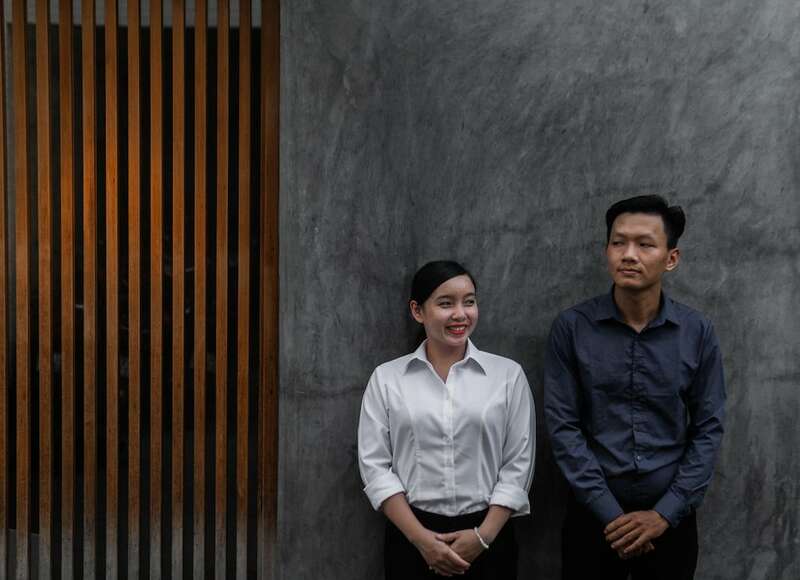 Without realizing, the location for their new gyoza shop was opposite one of Saigon’s Japan towns most beloved whisky bars with a similar name—Powers Bar. Chikara, on this corner, is ideal for watching the stream of drunken businessmen and massage parlour staff traversing the neon-lit alleys outside as night falls. “The name ‘Chikara’ means ‘power,’” Kazuya Yokoyama says about his gyoza shop in Saigon’s Japan Town. Kazu, from Nagasaki, opened Chikara with his business partner four months ago. We ask him for two glasses of whisky and soda—the classic Japanese “highball”—and a plate of karaage and some gyoza. The Oita-style karaage is supremely crisp on the outside with tender pieces of chicken inside and the half-moon shaped gyoza contain a savory mix of pork, green onions, ginger, and garlic. It’s flawless drinking food. “There’s another place we should try nearby,” Takaaki remembers. The Oita-style karaage, some of the flawless drinking food served at Chikara. Italian food is Japan’s unlikely culinary passion. American servicemen introduced Italian cuisine to Japan as early as the 1920s. But the trend for eatinng Italian really took hold around the time of the Asian financial crisis in the early nineties when Japanese went looking for something cheaper and more cheerful than the refined French cuisine that had become popular in the years before. Upstairs at Cover there is counter seating and a walk-in wine cellar, and in the basement there are rooms for groups and couples. Despite the popularity of Italian food in Japan, it’s rare to find a restaurant in Saigon’s Japan Town that doesn’t serve classic dishes like ramen and gyoza. When we walk in, Clover’s staff are carefully slicing into a leg of serrano ham at the counter while six bottles of house wine bob around in ice water by the door. Then Yoshifumi Wada arrives. He’s the head chef and CEO of Wonder Kitchen who came up with the concept. 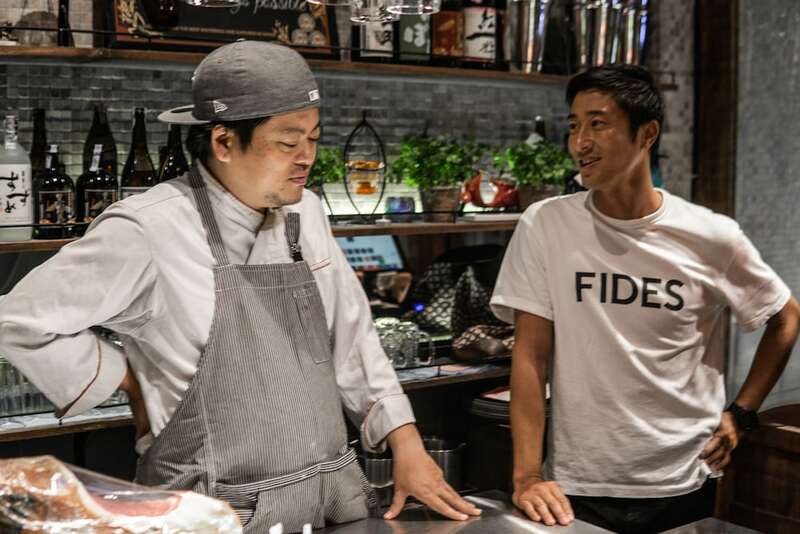 “I think I’ve helped develop around 130 restaurants in total,” Yoshifumi Wada remembers as he ties on his apron. Yoshifumi Wada’s Wonder Kitchen is behind some of Saigon’s most popular Japanese restaurants—like Wakaba on Thai Van Lung. “I think I’ve helped develop around 130 restaurants in total in Japan and Vietnam,” he remembers as he ties on his apron. Clover is the latest. We order a chilled ratatouille, the Mediterranean-style vegetable stew, a salmon salad with crunchy peppercorns and almonds, and a bowl of spaghetti. Content, we head off to our final stop. Most nights out around here end at Mangetsu. 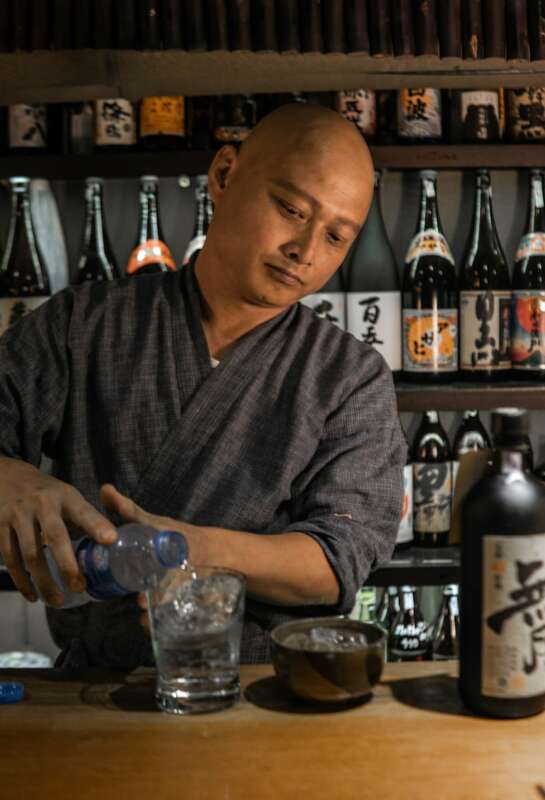 The darkly-lit basement shochu bar starts to fill up with regulars—and their plumes of cigarette smoke—shortly after sunset. Mangestu Shochu Bar serve small plates of refined izakaya-style dishes and bowl-like cups of shochu until well after midnight as well as sake in “masu” boxes. 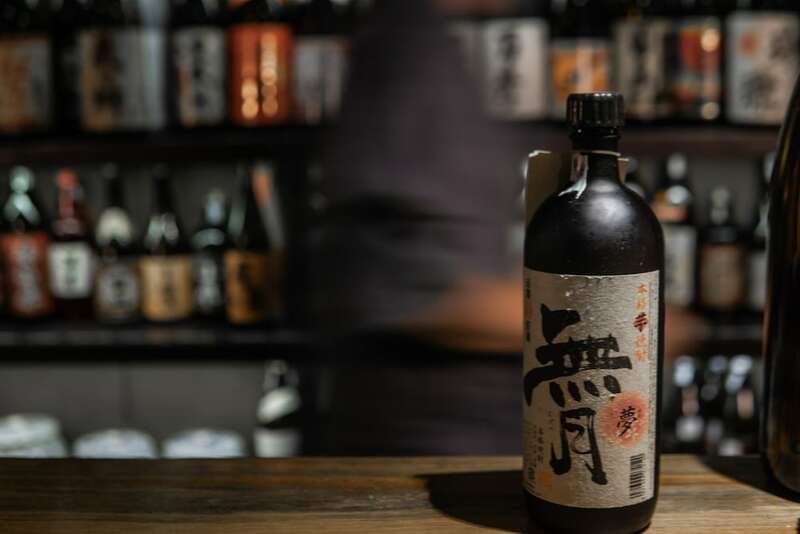 And Mangestu Shochu Bar keep serving their small plates of refined izakaya-style dishes and bowl-like cups of shochu until well after midnight. Mangetsu also serve sake in a “masu”—a square wooden box into which a short sake glass is placed and filled until overflowing. 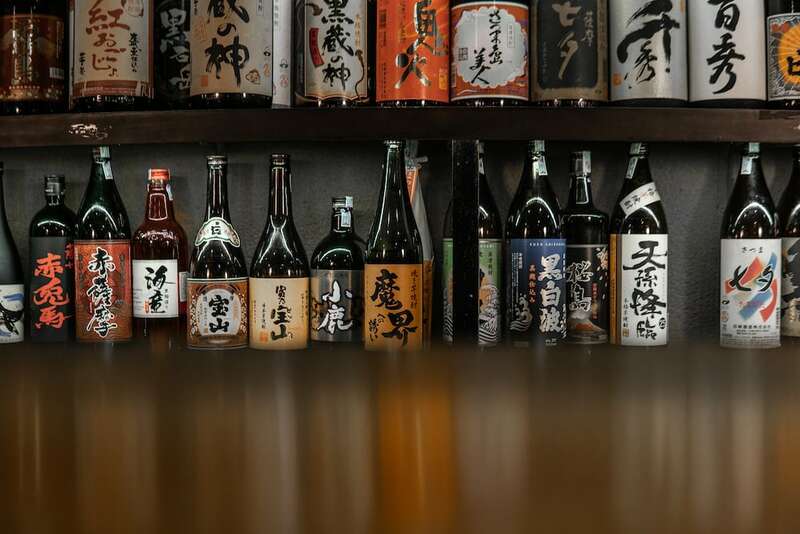 “I think I have a bottle here?” Takaaki asks the owner, Takanobu Tani, who starts rummaging through the lines of bottles on the shelves for the one with Sushi Rei owner’s name on it. Mangestu is often the last stop of the night, and it’s ours too. Inside are surfing posters and lines of shochu bottles. Often misidentified as “Azumaya”—the name of the hotel above it—the basement bar is named after the owner’s brilliantly bald head; Mangestu means “full moon” in Japanese. He hands over the bottle of shochu with Takaaki’s name on it. “With water or on the rocks?” he asks pouring out a couple of glasses of the sweet potato spirit. Mangestu means full moon—a tribute to the surfing obsessed owner’s brilliantly bald head. We order a couple of dishes. The cured Danang skate wing is rich and salty, but it’s balanced with a sweet creamy scoop of mayonaise. And we add the perfect counterpoint—a refreshing coriander and cheese salad. Takaaki checks the date when he bought the bottle of Mugetsu shochu that they’ve kept behind the counter for him. 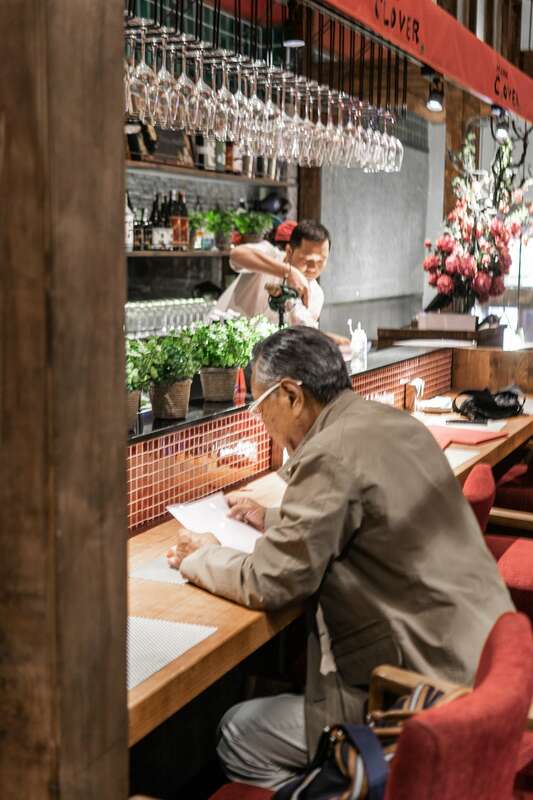 “Wow, July…last year,” he murmurs realizing he’s been so busy running Sushi Rei, probably Vietnam’s best sushi restaurant, and Robata An, one of the city’s favorite casual lunch spots, that he hasn’t been to Mangestu in quite some time. The bottle of Mugetsu shochu they’ve been keeping behind the bar for Takaaki.